Impact: If you haven’t updated your school firewall and filtering products you may lose access to the service in the event of a problem with one of our providers. Detail: In the Summer term we released an update to our connector software which provides resilient access to our services through a second internet service provider. To ensure you receive access to the service in the event of an issue with one of our providers there were important changes to our connectivity requirements which required action by your school. This is a reminder for those schools who haven’t already confirmed they are ready for this possibility. 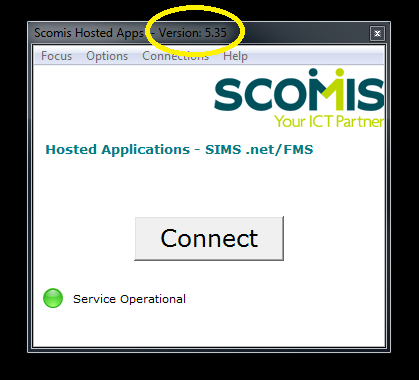 Ensure you are using the latest version of our software throughout school, this is currently version 5.35 which is displayed in the title bar of he application. Visit www.scomis.org/go/hosted to obtain the latest version of the software.Please note: the software should automatically update from version 5.1 through to 5.35, if you are stuck on an older version please log a call with the service desk on 01392 385300 and we can investigate why the update is not working. If you do not keep your connector up to date or check your school firewall and filtering products you may lose access to the service in the event in the event of a problem with one of our internet providers. Please log a call with the service desk on 01392 385300 if you would like any assistance with this. Posted in Connector, Hosted Apps, Services and tagged Connectivity Requirements, hosted applications.